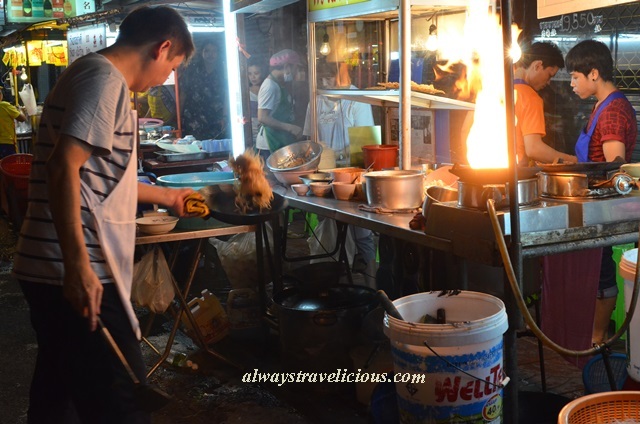 15 Things to Eat in Bangkok Chinatown, Thailand - Always Travelicious ! As always, Bangkok’s Chinatown is one of the best places to find good food. 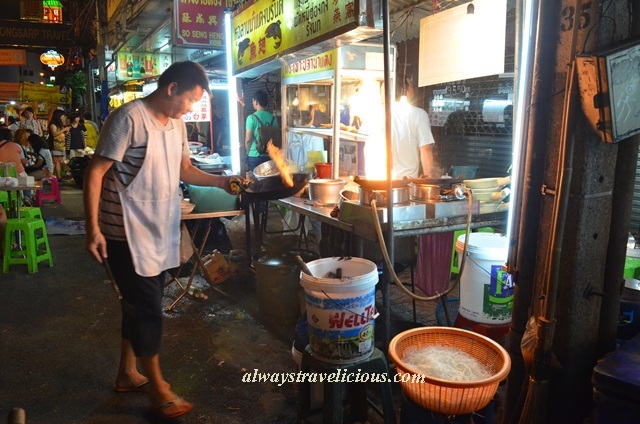 Besides the uber affordable food, the most extraordinary part is you find gourmet ingredients such as bird’s nest and fish maw, prepped on a mobile cart by the roadside. Thanks to my bestie, Kat from SpoonSpatulaSaturday, we went on a gastronomic adventure and tried more things than we could stomach and still wished to try more. You will be able to find most of the food featured in the post along the main road of Chinatown, Yawarat Road, except for No. 8, which is hidden in a small lane. 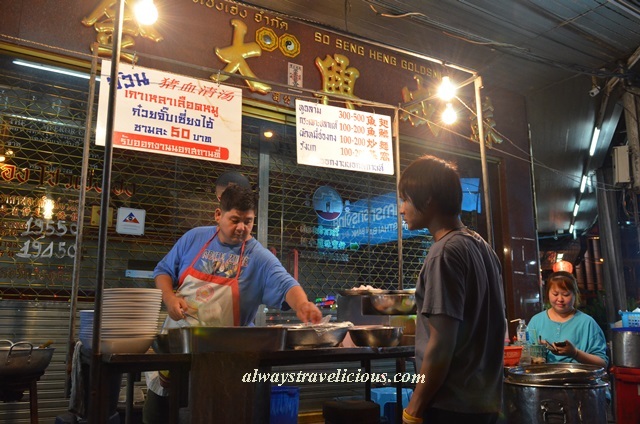 Now you know there are so many things to eat in Bangkok Chinatown, go explore and bon appetit! Bird’s nest is a delicacy loved by women for its gelatinous texture and collagen content thought to enhance skin complexion. It is a luxury item where 1 kg of bird’s nest can sell for thousands of dollar so naturally it’s something you won’t expect to eat at a road side stall. Lucky for us ladies, there are several bird’s nest vendors on the streets of Bangkok in Chinatown, selling bird’s nests with a topping of your choice – egg or gingko, ranging from 100 – 300 Baht per bowl. Fish maw (or swim bladder) is another item you wouldn’t normally find on the road side. 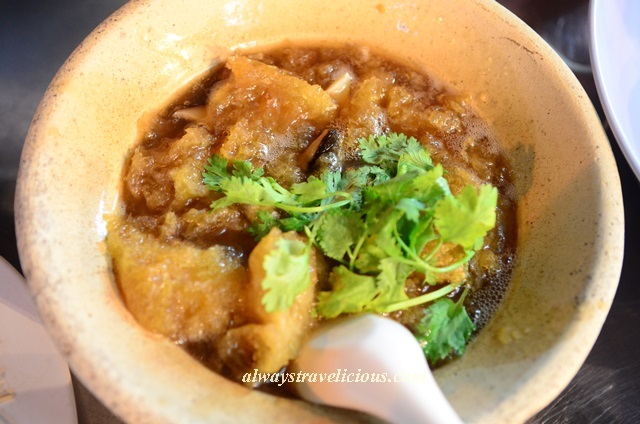 The only time I get to eat fish maw is during Chinese New Year, served as a delicacy together with sea cucumbers and mushrooms. The claypot fish maw in Bangkok Chinatown is just as good as any proper Chinese restaurant. 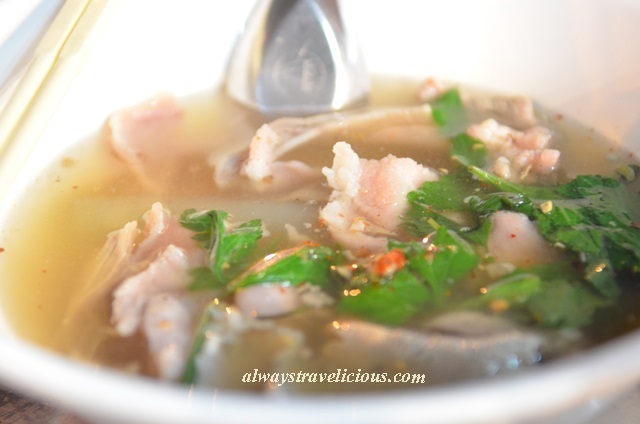 The texture is chewy, lightly crunchy, and the porous sacs lock up the braised broth within. When it arrived on our table, it was wobbling away invitingly. The best thing is, it’s only 100 Baht per pot! The stall is next to the fried noodles stall at Number 7 in this list. With a big coconut on the bottle, one would presume it’s coconut juice; after all, coconuts are all over Thailand. But no, it is coconut nectar juice, with the taste being just as weird as it sounds. It is unrealisticly sweet, almost like concentrated sugar syrup and the strangest part is, it has an infused flavor of corn flakes. Kat says that it has no sugar added and fair enough, at the back of the bottle it says “100%” (nectar juice?). Grab this peculiar drink from the 7-11 in Chinatown. 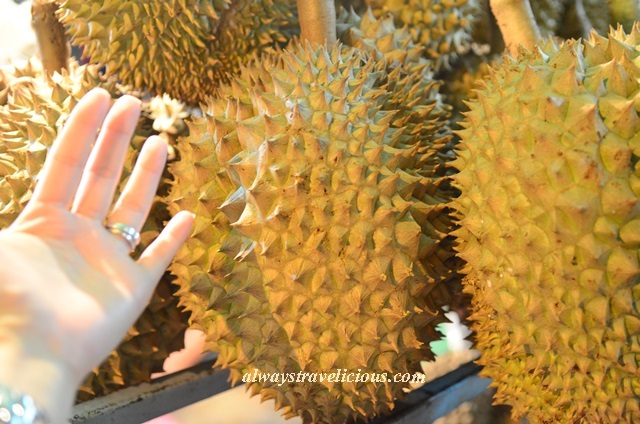 Thailand is the home of various durian breeds such as Golden Pillow and Golden Finger. The pungent odoriferous or fragrant fruits – depending on whether you love or hate this fruit, has wholesome and creamy flesh. With its exquisite texture, it is crowned as King of Fruits. 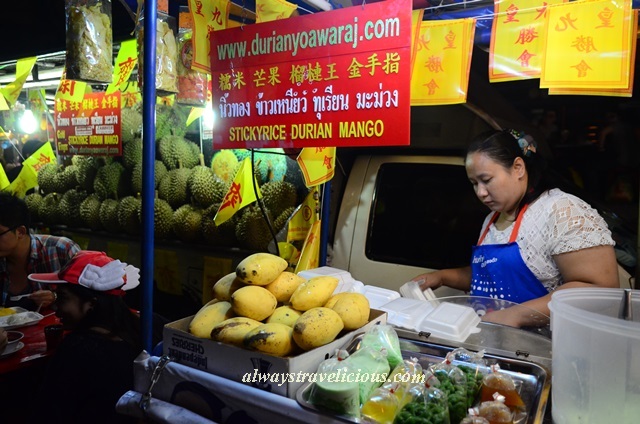 Personally I think Thai durians are less “smelly” than Malaysian breeds – so they are good starters for first-time eaters. With the absurdly sweet mangoes and sticky rice soaking up the flavors of coconut milk, the duo is a classic, irrisistable dessert. The rice at this particular store was a little too firm though not a major let-down. Mangos can be substituted for durians if you wish. Pomegranate and “orange” juices are two popular freshly squeezed juices that are selling along the roadside of Chinatown. I’ve always loved pomegranates with their clusters of red rubies that burst with their distinctive sweetness. They can be a messy fruit to eat if you don’t know how to peel them correctly, and sometimes ingesting the bitter fruit membrane can be a spoiler. I was elated to see these pure juices in vivid red that saved me the hassel of peeling the fruit, and happily chugged almost all the juice, before realizing there was only one tiny sip left for Gary, who glared at me in disbelief. This citrus juice is a new discovery for us. With its green skin and yellow juice, I thought it was some sort of lime fruit and I was prepared for a sharp acidic flavor. Instead, the juice is elegantly sweet, the same kind of sweetness as navel oranges though not as intense, accompanied by a scent of pomelo. I highly recommend this “orange” juice that has the hybrid properties of an orange and pomelo. These delicious noodles are fried in flaming fire – literally. The strength of fire is an important element in Chinese stir-fries, which allows food to be cooked quickly on high heat, and simultaneously catching blazing flavors of the wok – also known as “wok hei”. Each plate of noodle is cooked in less than 2 minutes of time, with the man tossing the noodles effortlessly in style it was like watching a flying-noodles-show. If you visit this stall, grab a seat facing him and enjoy the show. This fried noodles stall is located off the main Yawarat Road. Despite its hidden location, these fried koay teow noodles with chicken and squid are popular with the locals. The noodles are unique because they are not fried with the typical big Chinese woks. They are fried on a yellow flat pan (brass pan perhaps?) which seems to cook a little slower than the classic wok , resulting in a bundle of steamy and chewy noodles. The portion is small – I can finish one portion in two bites – so that probably makes it even more sought after. The uncle was very protective of his trade secret and uttered to me “no photos” when I tried to take a picture of the noodles cooking in the pan. I managed to take one photo of the stall at a distance so I hope I have not exposed your secrets uncle. Look for Soi Itsaranuphap to locate the stall. All these people you see in the photo are not random passersby. They are all waiting for these scrumptious-looking kaya buns. The reason I say “scrumptious-looking” is because I did not have the chance to try it to see if they were really scrumptious. We had stuffed ourselves too much so these buns will have to wait till next time. I do know that if you follow the local crowd for food, you will never go wrong. Coming from the same stall that sells the claypot fish maw (I know, not exactly a conventional pair), the silken blood cube, chewy intestines and tender meat are all mixed in one bowl with a surprisingly light broth. No awful offal smell and it was enjoyable even for an infrequent offal eater like me. Not a fan of offals? The meat-only soup is available. 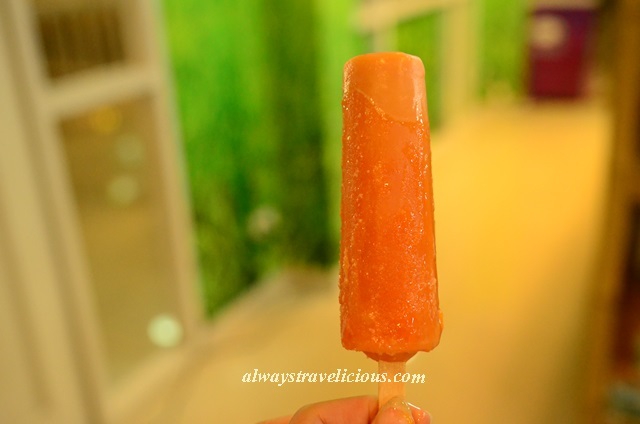 While I ate these popsicles in Hua Hin Night Market, give them a go when you see them in Chinatown because they are a quick way to familiarize with Thailand’s uniqe flavors. The one in the picture is coconut with black glutinous rice and other flavors include tamarind, coconut, durian, Thai custard and Thai milk tea. 12. Roast Pig’s Face “Lin Zhen Xiang” (林真香) is famous for their pork jerky and many bring home souvenirs from here. The roasted and evenly-browned pig face drew my attention. I have eaten roast pigs many many times yet seeing just the face sliced off, presented on its own was still somewhat bizzare to me. I didn’t have the guts to try it because the face was too visible and I wouldn’t know where to start – the ears, the nose or the eyes? So if some of you have eaten this, I want to know what it tastes like! There is also the less adventurous version using the duck. The smell of grilled seafood is unmissable and undeniably tempting when you are strolling the streets of Chinatown. You start smelling the aroma when you are not even close. You don’t need a GPS to find the seafood restaurant; just follow your nose. The seafood served is fresh, fresh, fresh; and fresh enough to be served raw such as the prawns. The best ways to enjoy the seafood is grilled or Thai Style where no spices are spared in the making. There are two seafood restaurants in the area – T & K (green shirts) and Lek & Rut (in red shirts), seeming to serve a similar range of food. I suspect both are probably equally good although T&K seems to be the popular one looking at its state of perpetual full-house. Kway Chap does not get more refreshing than this. I’ve always had the carnivorous version at Kimberly Street in Penang which is full of innards, duck slices, meat slices and never even thought about there could ever be a vegetarian version of kway chap. 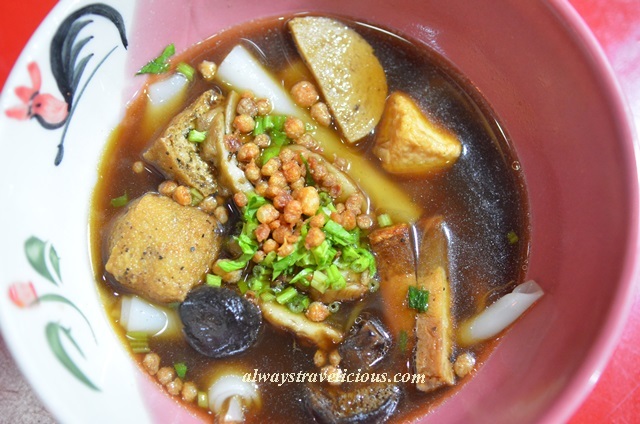 It is replaced by healthier ingredients such as tofu puffs, mushrooms, crunchy fried tofu bits and the accompanying broth is flavorful and hardly oily. 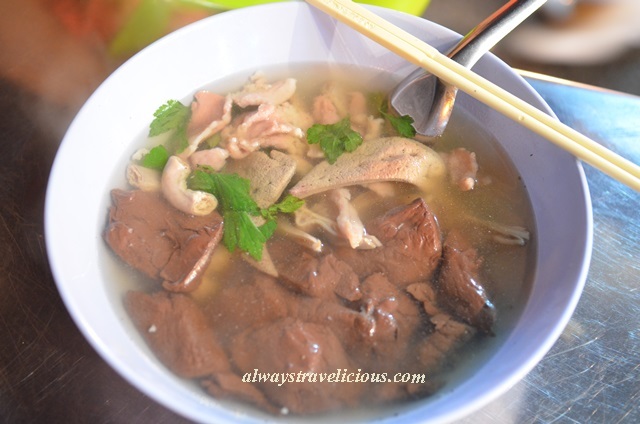 This is Thailand’s version of Yong Tau Foo with the addition of fermented bean paste that makes the soup pink. The dish is usually seen with a different spelling like “Yang Ta Fu”. I fondly refer to this dish as “pink soup” when I talk to Kat. There are mostly fishballs, tofu, and not so much of vegetables stuffed with fish paste like the Malaysian version. My favorite are these fish dumplings – where the dumpling skin is made with fish, wrapping up the generous portion of seafood filling. 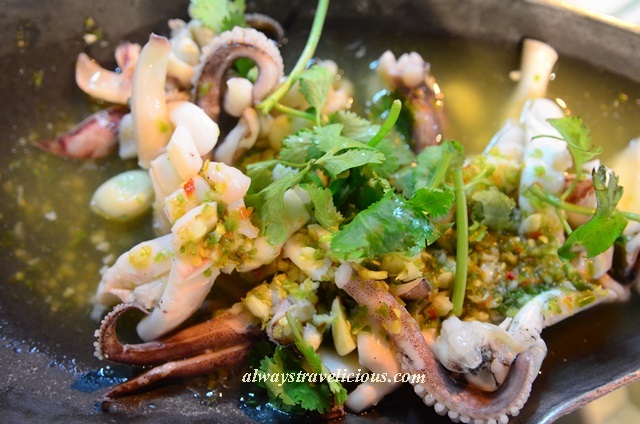 Here are some examples of fine Thai cuisine… check it out, don’t be afraid! All look so delicious! I can’t decide what to eat if I’m going on a single backpacker trip. Everything looks so appetizing! I’m especially intrigued by the hybrid pomello oranges. In Cambodia I had the sweetest pomellos, I are them at every chance I got- but those hybrids are they slightly tart like pomellos? And with green skin? I was surprised too at the unusual hyrbrid! It’s the size of orange with green skin and the scent is pomelo while taste is completely orange. strange right? Food lover like me can go anywhere to taste the yummy delicious food dishes. It seems like all the places in Thailand serve good quality food, i mean all tourist can happily have food there. I have been to both the seafood restaurants in the area – T & K (green shirts) and Lek & Rut (in red shirts), classic prawns in Thai style was mind blowing. You have clicked wonderful photos, which camera lens do you use for clicking such a amaze photos? You are right, food in Bangkok is pretty good in general. How is food and Lek & Rut? It seems to be the less popular one, although serving more or less the same thing as T & K.
Lek & Rut (in red shirts) was pretty good as they served classic prawns in Thai style which was amazing in taste.. I went through Nikon D7000 which cost for Rs.55,450.00 and i cannot afford to buy it for now..May be next year i will buy it. I have recommended your blog for guest posting to one of my friend who work as travel expert at TripHobo. She will send you an email here – [email protected] . Hope even you will agree to publish guest post article on your site. Bird’s nest maybe it’s not my favourite dish.. but it’s worth to try it and have own opinion for it. Some people love it, some hate.. I quite like bird’s nest, especially when you can get it for a good price in bangkok !